Mortality and fishing of the Sumatran tiger (Panthera tigris sumatrae ) in conflict with humans is quite high raises concerns the extinction of this species. Tiger conflict occurs very rapidly, delay in response will result in retaliation from the public for hunting tigers by using poison, traps or snares. Improper handling of conflict could potentially lead to further conflict and involve individuals of different tigers, for example, because it turns out the tiger is have some cubs. The use of meshes for the safety pig farms andrice paddies. Management of cattle shed that is not feasible. Hunting and the use of snares / traps pigs anddeer in the forest edges and in the woods. Handling tiger conflict handling canpotentially lead to further conflict. 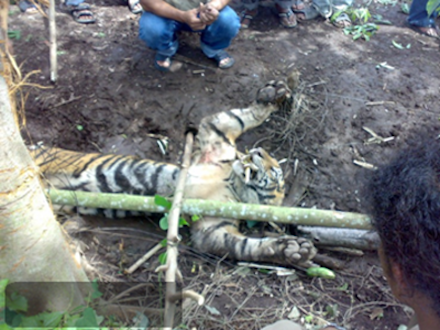 Indication of intent to murder a tiger conflicttraded.